When it comes to deceptive promotion and marketing, there are few films that can compete with Life of Pi. The movie’s commercials and trailers seemed to represent a happy-go-lucky family-friendly adventure flick that empathized CGI animals and globe-trecking over a substantive story. In reality, Life of Pi is a rather somber and philosophical survival movie about theology and man’s relationship to the natural world. Although Ang Lee’s award-winning drama is beautifully crafted and gripping entertainment, it rises above its peers primarily because of its challenge for audiences to reflect on themes that other movies dare not broach. Like that catchy Coldplay song? TOO BAD – IT WASN'T IN THE MOVIE. As a young Indian boy, Pi is intrigued by different religious faiths; raised a Hindu, he once worshiped thousands of naturalistic deities, but soon opened his mind to other beliefs, most notably Islam and Christianity, which he originally questioned. Pi privately develops a kind of all-inclusive religion that incorporates elements of all faiths he may draw upon depending on his circumstance. His doctrine draws disdain from his nonbelieving older brother and materialistic father, a firm proponent of “science” who chides his son, “Believing in everything is no better than believing in nothing.” Eventually, due to financial struggles, Pi’s family elects to move their zoo to Canada, where the business climate is more stable. On the voyage to North America, a seemingly spontaneous tempest besets the family’s cruise ship, yet Pi and a quartet of animals manage to board a lifeboat. It is here that Pi’s faith begins to face its greatest test; lost in the Pacific as the only human survivor of a catastrophic wreck, he must endure weeks of severe hunger, thirst, and looming insanity while also caring for Richard Parker, the massive tiger that previously devoured the lifeboat’s other passengers and looks on him hungrily. In truth, the only reason Pi persists so long is his unyielding trust in God and commitment to the tiger. All of this story is encapsulated within a conversation between a grown Pi and a friend whom he hopes to persuade of God’s existence. While I compliment the film’s writer, David Magee, for attempting a non-linear approach to storytelling, the technique wasn’t nearly as effective here as in The Princess Bride, partly because of the bad acting by Pi’s friend but mostly because it dumbed down the movie’s message so far as to strip it of all subtlety and render it preachy to Atheist viewers, whom the story wouldn’t likely persuade anyway, as I’ll explain later. As entertainment and visual spectacle, Life of Pi is an extraordinary movie to behold, much like Ang Lee's former work, Crouching Tiger, Hidden Dragon. Contrary to many viewers’ remarks that the film is slow and boring, I found it to be an emotionally intense and captivating story about survival at sea and a young man who lives in constant peril of nature’s fury. The movie takes some time getting to the narrative’s turning point, i.e. the storm that serves as the catalyst for Pi’s struggles, but all good adventure films by necessity have high and low points. Movies like Transformers 3 that strive to be fast-paced and action-packed from beginning to conclusion often turn out boring. A visually beautiful work with excellent computer animation and art design, Life of Pi should be held alongside Prometheus, The Avengers, and The Dark Knight Rises as one of 2012’s most dazzling pictures. I was initially skeptical about the heavy use of CGI in the scenes involving animals, but was pleasantly surprised by how effectively the filmmakers used it as a substitute where real animals would not be a feasible option. In some scenes the tiger is obviously a digital creation, but it behaves so realistically throughout the film that I didn’t really mind the CG. Life of Pi gives a more accurate portrayal of wildlife than many other films; the tiger here is a ferocious and intimidating beast who only accepts Pi’s presence after the boy forcefully asserts his own dominance. Indeed, for much of the movie the two castaways remain separated on different platforms due to the tiger’s ravenous appetite, which eventually drives the animal to brave the ocean’s waters to seize its companion as a potential meal (most of the “happy scenes” in the trailer aren’t that happy in the actual movie). Unfortunately, Life of Pi’s philosophical teachings are not nearly as strong as its storytelling. The movie basically confronts the issue of theism vs. materialism, using Pi’s fantastical story to endorse the former and shed doubt on the latter. Our titular hero eventually washes up on the shores of Mexico, where he gives his rescuers two vastly opposed accounts of his ordeal on the high seas. The one the audience has witnessed is allegedly one of miracles and wonders, orchestrated by an omnipotent God, while the second story he relates is devoid of spiritual influence and utterly dull in comparison. When Pi asks his friend, and by extension the film’s audience, which story he prefers, the man answers that he favors the one with the tiger, to which Pi remarks, “And so it goes with God,” as if that’s sufficient to prove his religious faith. By Pi’s reasoning, since both narratives leave gaping questions unanswered, such as why the boat sunk, and since neither can be proven by evidence, the truth concerning his journey is completely relative, determined purely by what the individual wants to believe. Through analogy, Pi insinuates that God must be real because a world of miracles and magic governed by a sovereign deity makes for a far better story than a chaotic, disordered, and godless world where matter alone exists. Neither religious documents nor scientific theories offer complete explanations of the universe and neither (supposedly) can be supported with physical proof, but goshdarnit, Genesis is a far better read than The Origin of Species, so it probably has more truth to it. The writer’s argument is downright simplistic: by this same logic, geocentric astronomical theories expressed in Dante’s Paradise and Greek mythology are to be deemed more accurate than the heliocentric revelations of Galileo and Copernicus, now held to be objective, scientific truth, merely because Helios’ laps around the globe and Dante’s experiences beyond the Fixed Earth are more entertaining fables. It’s nicer to think that the universe revolves around us, but that’s an even greater fantasy than Pi’s adventures. Likewise, there are a variety of narratives one could accept on the fate of Osama Bin Laden, none of which tell the full story or are substantiated by a shred of evidence other than empty testimony. You can believe that he passed away due to old age or disease years before 2011, a rather dull but down-to-earth hypothesis, or that he was violently terminated in a glorious raid on a Pakistani compound by Navy Seals, a more dramatic and thrilling account told with countless variations, one of which was depicted in the popular film Zero Dark Thirty. Of these two accounts, the former is more plausible, but Life of Pi’s philosophy would defend the latter simply because it’s more satisfying to think, “We got him,” than to acknowledge, “He got away.” The movie’s argument for theism just isn’t persuasive and seems more like a thesis on relativism (reality is whatever makes you feel good) than on religion. Even if Life of Pi does manage to spark a flame of religious belief in some secular viewers, the movie’s message is so vague that it’s unlikely to deeply service Christianity, Islam, or any of the churches Pi experimentally follows. The wisdom of Pi’s father, that believing everything is equivalent to believing nothing, goes woefully overlooked not only by his son but also by the movie's writer, who ultimately endorses a kind of polytheistic relativism instead of a concrete faith in one true and sovereign God. Pi dabbles in a wide variety of religions, asking Jesus for deliverance, shouting "Allah Akbar!" at the heavens, and apologizing to some fish god as he hacks it open, but never really commits himself to a single deity. Like its main character, the movie sways back and forth between a thousand spirits and fails to point towards one God in three persons; its assertion that believers can accept some Biblical truths while discarding others they don’t agree with is antithetical to Scripture and egregiously misleading to audiences. 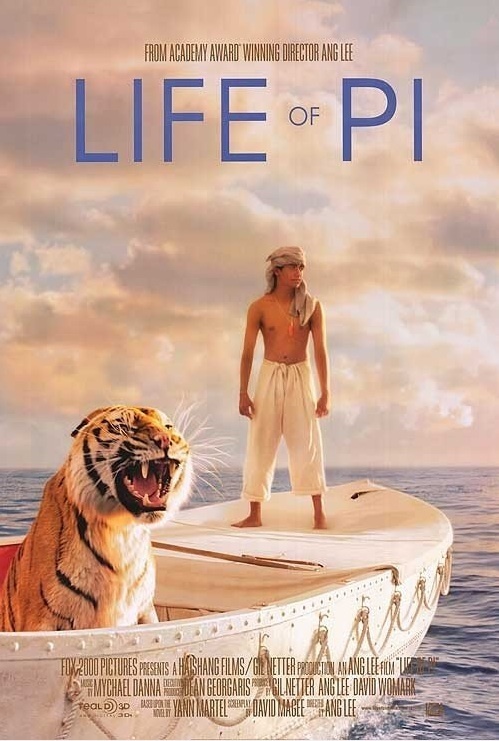 Life of Pi is far from profound, but at least it’s thought-provoking, which is an attribute most movies can’t claim. A film that’s well acted, visually captivating, and philosophically challenging, it’s without a doubt one of the best movies of the year, however cheesy that sounds. I only wish that I could compare it to its Oscar-winning competitor Argo, filmmaker Ben Affleck’s Democrat fundraiser heartfelt tribute to Canadians and filmmakers, which I have not yet seen. Evidently, that won’t stop me from making comparisons.